Easy Dental is on-premise practice management software from Henry Schein that’s the choice of over 20,000 dental professionals around the world. Easy Dental 11.2 is designed to work best with Windows 8 Professional or Enterprise operating systems, but it is backwards-compatible with XP Professional, Vista Business/Ultimate, or 7 Professional/Ultimate. For most smaller offices, you won’t even require a dedicated server — one of your workstations can likely serve. In addition to standard features like scheduling, billing, reporting, and patient record-keeping, Easy Dental has electronic perio charts, templates for treatment plans, recall appointments, and a host of add-ons or support services, including website hosting, electronic backup, electronic claims services, and a number of patient-facing features. Easy Dental is offered at a relatively low price with a single user license, and is best suited for small to medium-sized practices with one to two dentists and accompanying hygienists plus support staff. The modular design means you won’t pay for any functionality that you won’t need, but could mean that you end up paying more long-term, if you need a comprehensive, more all-in-one solution. 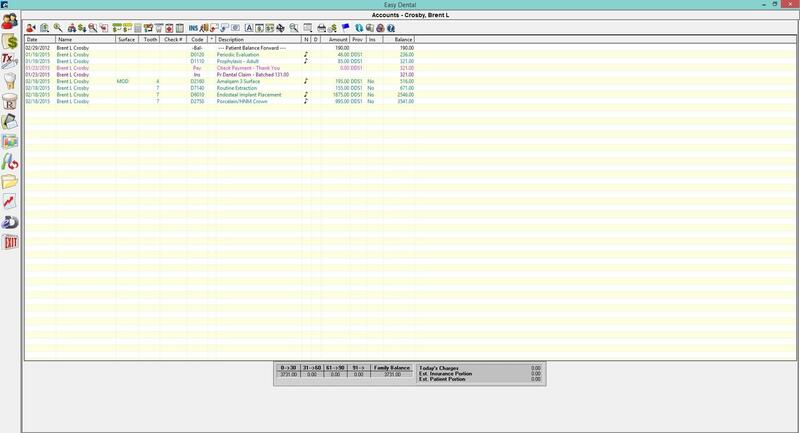 Integration with third-party systems could be better, but Henry Schein does offer a complete, self-contained dental software ecosystem. If you want to integrate with a less common system, custom development options are available through the Henry Schein TechCentral service. Not sure if Henry Schein’s Easy Dental is the right software for your dental practice? Check out more options in the Dental Software Product Selection Tool, or if you’d prefer, call, click, or email to speak with an unbiased Technology Advisor for a no-cost, no-obligation consultation on your practice’s unique needs. Learn everything you need to know about Easy Dental. Our experts will reach out to you shortly.